Here are a few more commercial fishermen (and women) who I’ve come across while researching Funter Bay. This is to follow up on my previous post. Funter Bay has been used as a landmark or boundary point for various fishing regulations through the years. Pete Hobson, a Tlingit man from Angoon, reportedly died at Funter Bay in 1930 while on the seiner Myrtle. He was mentioned in my previous Funter Bay Fishermen post, it was implied that he owned the Myrtle, and in 1924 he pulled two trollers off the rocks at Funter. The troller Ada-May was listed as visiting Funter Bay in 1942. She was a 31ft gas fishing boat built in Ketchikan in 1924, belonging to James Paddock of Juneau. (The Ada May was also busted for bootlegging in 1930 off Point Retreat, with Ed Hibler and Scotty & Mrs. Boyce on board). Max & Ann Dorman lived at Funter around 1943. They had moved to Sitka in the 1970s and were described as retired trollers who lived at Funter and at Elfin Cove. They had the vessel Pal in 1937. “Bell” and “Al” Schramen fished the boat Aurora, and Bess and Chet Kimmerly had the boat Bess Chet, fishing around Funter Bay. (Per Lazzette Ohman). Aurora is listed as a 38′ fishing boat built in Bellingham in 1948. Bess-Chet was a 37′ fishing boat built in 1957 in Tacoma. In 1954 the troller Helen was found beached at Funter Bay by the crew of the Mabel C. George J. Harju, 48, of Juneau was found dead at the Helen‘s wheel of an apparent heart attack. (per Pacific Fisherman Handbook, Vol 52). Cora and Curly Warnock were Funter Bay residents (Per Lazzette Ohman). I’m not sure if they fished, they may have been hunting guides. 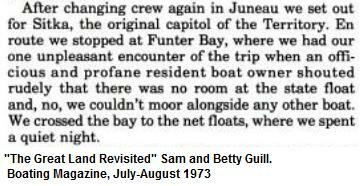 An “officious and profane resident” fishermen in Funter Bay was reported in 1973. There are probably several people this could have been! (This is sometimes the attitude towards “yachty” boats, fishermen usually don’t want “tourists” tying up next to them due to conflicting schedules, or just general cussedness). 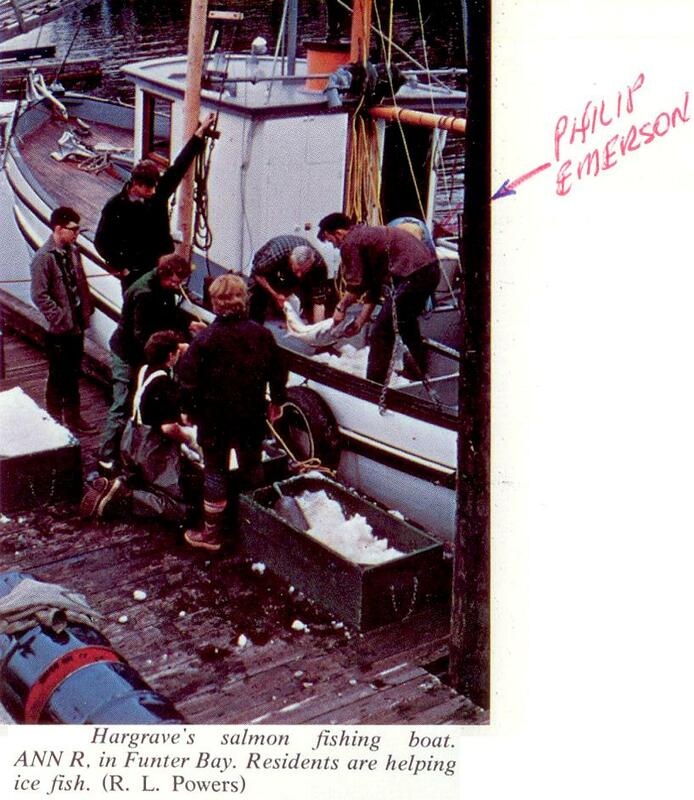 I’ll probably have another fishing update in the future, but to wrap this one up, here’s a picture from Alaska Geographic magazine with my Dad on Harold Hargrave’s boat. Thanks to Richard Powers of the Whaler’s Cove Lodge for giving me permission to use his photo! This was from the Summer 1973 issue (Vol 1, No 3, “Admiralty…Island in Contention”). This entry was posted on Wednesday, June 5th, 2013 at 9:30 am and is filed under Funter Bay History, Funter Bay People. You can follow any responses to this entry through the RSS 2.0 feed. You can leave a response, or trackback from your own site.